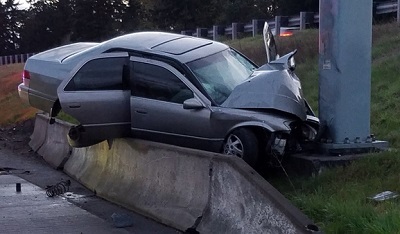 On Saturday morning, April 18th, police responded to the scene of a single-car accident on Interstate 5 in Federal Way. A 1998 silver Toyota Camry had veered off the road, landed on top of the jersey barrier, and struck a pole by the side of the highway. The driver of the car had not been wearing her seat belt at the time of the crash. Emergency responders pronounced her dead at the scene. Isaiah played in his next scheduled game against the Chicago Bulls before returning home for his sister’s funeral. Before the game, the Boston Celtics honored Chyna with a tribute and a moment of silence. Celtics fans chanted “MVP” as soon as they saw Isaiah Thomas. The Washington State Patrol is still investigating the circumstances of Thomas’s crash. When they examined the scene of the accident, they could not find any marks on the road indicating that the Toyota Camry had braked or swerved sharply before the crash. Witnesses who had been on the road prior to the accident told troopers than they saw the car driving normally and that they did not see anything obvious that caused the crash. Investigators are still waiting on the results of a toxicology test. The Washington State Patrol did not find any evidence pointing to drug or alcohol use at the scene of the crash. They are looking into the possibility that Thomas lost control of her vehicle after falling asleep at the wheel. In cases involving fatal single-vehicle accidents, investigations can often stretch for weeks or even months. Since police rarely have recordings of what was going on inside the vehicle before and during the accident, they must reconstruct the circumstances of the crash based on the information they have available. That may include toxicology tests, an autopsy, eyewitness statements, examination of the vehicle, and examination of the scene for skid marks or other clues.